Zen of Brick: A comprehensive technical guide to brick veneer construction: 1996. Relief From Post-Tensioned Headaches: Technical article on the behavior and design of post-tensioned concrete. Progressive Architecture Magazine, 1994. Post-Tensioned Structures: Technical article on the behavior and design of post-tensioned concrete. Technical Advisor Magazine, 1993. Building Envelope Design Guidelines: Technical guide for design of exterior envelope elements. Puget Power, 1992. My history relates to construction and architecture for nearly all of my current 56 years, (in 2011). It includes deep personal immersion in architecture, hands-on construction experience extending over four decades to the present day, technical training in relevant arts and sciences, as well as a 30-year focus on building envelope integrity, as of 2011. Without a doubt, my architectural roots are founded in my childhood in Prague, in the Czech Republic, where I spent the first 12 years of life. It was here, in a beautiful, ancient city filled with hundreds of buildings dating back 600 years, even some approaching a thousand years of age, that my appreciation for fine architecture, craftsmanship, and long-lived construction, began. Throughout this early childhood, I had the unique opportunity to observe how various materials weathered over the centuries in different exposures, thus beginning, quite unwittingly, my familiarization with material behavior and degradation patterns affecting various construction elements. I felt a deep gratitude for the wise development of my city by King Charles IV, whose gift traversed six centuries to enhance the early stages of my own life. To this day, this experience reflects in my professional approach, wherein I advocate that buildings, particularly institutional ones, be designed and constructed to provide useful life for centuries, rather than the 40-year life-cycles used as a standard locally. My architectural experience continued with formal training in architecture, a field in which I received a master’s degree from the University of Washington, after my initial bachelor’s degree in Chemistry. While still in architecture school, I designed, as well as in many cases constructed, various residential projects, including several new homes, in the greater Seattle area as well is southern Oregon. During my subsequent tenures at the architectural firms of Van Horne & Van Horne and Mithun Partners, I served as project manager on various residential and institutional projects, increasing my familiarity with construction technologies of all types. As a significant part of the work at Van Horne architects involved the restoration of various government structures, my focus on the technical aspects of construction, particularly related to building envelope issues, accelerated here. My expertise in exterior envelope technology gained at Van Horne & Van Horne Architects was increasingly drawn-upon during my subsequent tenure as a project architect at Mithun Partners, further honing my skills and knowledge in this field. I also designed, and occasionally helped to build, various projects under my own name. The first home I designed, which I also built with a partner, was published in the Seattle Times for its unique solution of designing a solar home on a tight budget and on a shaded lot. 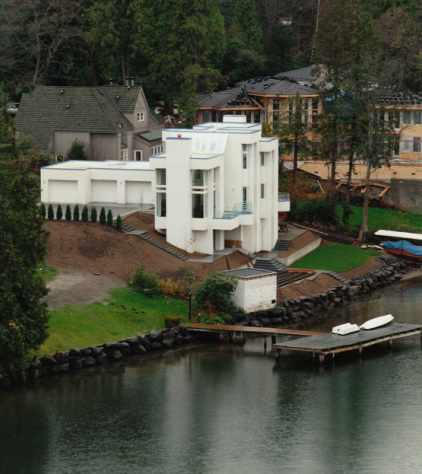 The first waterfront home I designed was selected as a Home-of-the-Month by the American Institute of Architects in 1990. At Mithun Partners, I also assisted in the design of a Boys’ Club facility which became a model for similar facilities nationwide. My architectural training and experience are supplemented by extensive hands-on construction experience, which by now spans four decades, beginning in my teen years, and continuing into my current fifties. This experience began in my earliest years while helping my father with various construction projects at our home, then progressed to working as an employee of a developer specialized in rehabilitation of older structures, where I began to notice very consistent failure and degradation patterns affecting various elements of building exteriors. I next worked for a construction firm, helping with all aspects of residential remodels, new homes, as well as small-scale office buildings. In 1981, I began my first firm, Solarcraft Design & Construction, which focused on the design and construction of residential-scale projects, with a particular emphasis on energy-efficient and solar design. 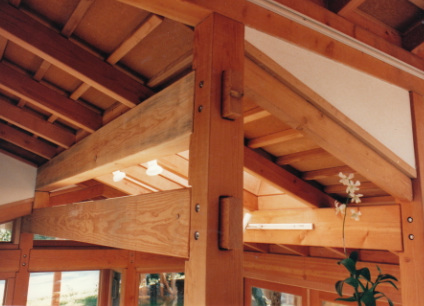 Projects of interest in this category included the design and construction of a new, solar home, the design and construction of a residential shop structure using Japanese-style, post-and-beam construction with wood joinery, as well as the design of a similar, wood-joined, post-and-beam residential addition. To this day, my construction experience continues to expand through my ongoing, intensive project to construct a Sino-Japanese influenced garden and remodel for my family. Through this project, already in its 11th year, I spend nearly a quarter of my time building masonry walls, designing and installing decks, ponds, flashings, and roofing, placing concrete, installing sub-grade waterproofing, pond membranes, etc. In short, I not only have theoretical familiarity with flashings, masonry, concrete-work, roofing, carpentry, etc., I mix mortar and lay masonry, install roofing and flashings, perform carpentry, pour concrete, build ponds, etc., on a regular basis, at a rate comparable to a quarter-time job, every year. In 1989, I began consulting full time in issues of building envelope integrity, under the name of Building Envelope Consulting Services. Combined with previous exterior-envelope experience, I have, as of 2011, consulted on roughly 800 projects. On average, roughly half my work consists of analysis of problems with existing buildings, intended either to correct such problems, or to identify responsibilities of various parties for such issues. Exposure to 300-400 buildings with problems allowed me to begin seeing distinct failure patterns, and to develop methods for addressing these, leading to the development of a library of highly-developed installation details. The other half consists of assisting in the design and construction of new projects. In this capacity, I have provided varying degrees of such guidance on roughly 300-400 projects. Some involve limited design guidance only, though many also include construction oversight pertaining to the entire exterior building envelope. Projects span the full spectrum of building uses and construction technologies, including institutional, commercial, and residential buildings, ranging from wood-framed single-family homes to major institutions with post-tensioned concrete structures, located in the Pacific Northwest as well as throughout North America and beyond. Please refer to the Project Gallery for more detailed project type descriptions. I also provide non-project specific consultation and lectures to construction industry professionals. Past lectures have addressed brick veneer construction, general exterior envelope design, sealant joint design, etc. Several other lectures are nearing completion in 2011. To assist clients with various aspects of exterior envelope design and construction, I prepared a 100-page guide to exterior brick veneer design and construction, under the name of Zen of Brick, in 1996. With no marketing effort, copies of this were purchased by the International Masonry Institute to help train masons, various architectural firms to help guide their designs, as well as general contractors to help inform their staff. Another such booklet, addressing sub-slab waterproofing, was prepared in 2000, and this has similarly been used by construction professionals to limit risks posed by sub-slab soil conditions. Other published work includes articles on post-tensioned concrete structure behavior for Progressive Architecture and Technical Advisor Magazines. Other such technical guides are in-process.